Note: As of August 2016, the trails to the summit of this mountain are closed and access is strictly prohibited. The operator of the rope-way saying: "If you go there you go to jail". It was a bit difficult for us to fully understand the reasons, but appearently, the eruption in 2014 (that took 60 lives) is still making the summit access considered dangerous. It was rather unfortunate that there was no easy or obvious way to get this information in English when planning our trip. Thus, we wasted a full day in order to learn this. There are at least 2, possibly 3 trailheads that may be used. From Kiso, the valley have signed side-roads for Ontake. When everything is back to normal, the best trailhead is the one further south (above a ski area. The road turns uphill at the end of a long lake. (A water reservoir with a dam at the north end). There is a large, free parking area on top and the elevation is (slightly) higher than the the top of the rope-way, thus saving a significant cost as well. This location is at N35.87322, E137.50317, elevation slightly above 2200 meter. The alternative trailhead would be the big parking area that you access from a different road in the valley, serving the rope-way. This road is also well signed. The parking area is a location N35.90174, E137.53731, elevation about xxxx meter. As of 2016, a round trip fare cost 2600 yen. This rope-way will take you to a suitable trailhead above 2100 meter. Please refer to other sources, the trails to the summit are straightforward to hike as soon as they have been declared safe and are re-opened. Bad news indeed, the drive all the way back down to the reservoir, up the valley and to the rope-way was 55 kilometer of very slow driving (sharp curves) road. Not much to do about it, we drove back down to the reservoir. There, we discovered that the road we had just driven along the reservoir, had been closed (for some sort of repair?) in the meantime. Backtracking, we located the road that ran along the reservoir on the opposite side. We were parked at the rope-way parking lot by 1000. Here, we discovered the ultimate bad news of the day, all trails to the summit were closed and unlawful to attempt. Thus, our plan to complete the climbing of all Ultra prominent mountains in Japan would definitely not succeed. 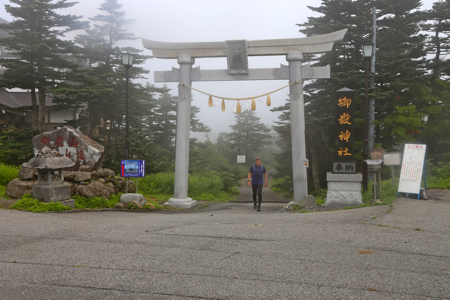 We got back into the car and headed for the base of our next goal, Haku-san, further west. It was already too late in the day to be able to climb it today. We found the Happo hotel next to the local reservoir and after some bargaining with the receptionist, an acceptable price for lodging. Here is a quick summary of peaks climbed in our trip to Japan.